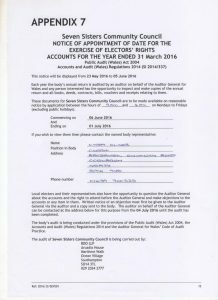 Notices of vacancies, elections, etc under S 232 of LGA 1972. This machine can help to save lives when a cardiac arrest occurs and has complete spoken instructions so that anyone can use it. It is totally safe as it will not operate if a cardiac arrest is not detected. 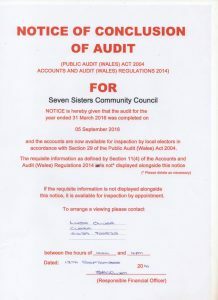 The Community Council is to decide at their meeting on 4th April where the defibrillator should be sited to make sure it is accessible to all in the village. A training session will be held shortly for all to attend. 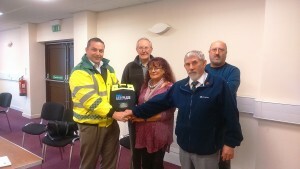 The picture shows Chairman Cledwyn Thomas, Councillors Lynn Parfitt and Mike Rivers and Clerk Lin Oliver accepting the defibrillator from Anthony Hamilton-Shaw from Cariad. Cariad is a charity that supplies defibrillators to the emergency services and communities throughout the country. They also fully maintain the machines. Notice of appointment of date for the exercise of elector’s rights. Record of Members attendances 2014 / 2015.